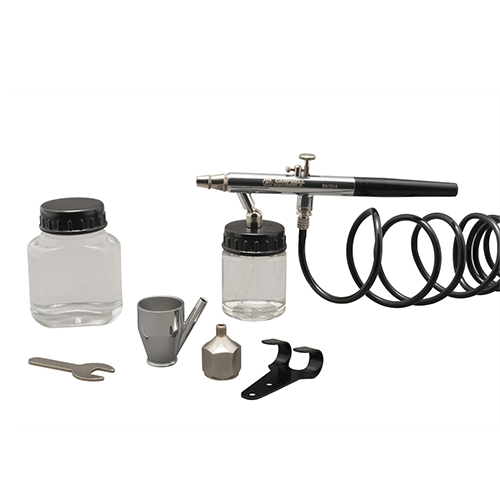 The Campbell Hausfeld airbrush kit (MP290001AV) is ideal for the hobbyist. Use it to paint crafts, stencils, murals and furniture, as well as T-shirts. This airbrush paints fine lines for pin striping, graphics, detailing, modeling and more. Its dual-action trigger lets you vary the line width while spraying. Includes a protective cap, 22 cc cup, 5 cc metal cup, 60 cc mix jar with lid, 6-foot air hose with adapter, hanger and molded case. 0.23 average SCFM requirement at 40 PSI.